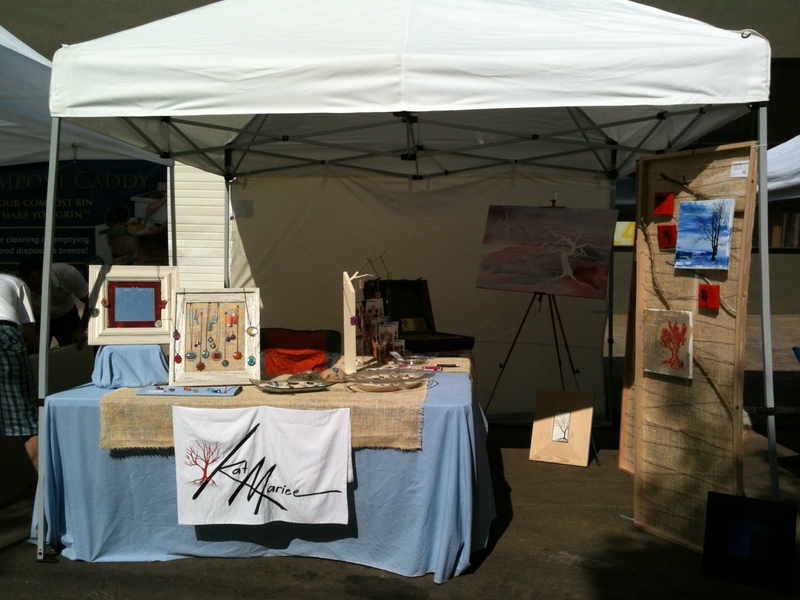 This summer I have done two street fairs so far. The people, the fantastic feedback, the encouragement, the sense of community, the people watching! It is all fantastic. But most of all its the in person aspect. Selling your product online is one thing. You can track your page views, you can keep an eye on how many etsy-ers give your items the ❤ and of course the email congratulating you on your latest sale will always be a welcomed surprise in my inbox! But, meeting your customers face to face is on a whole different level. Watching someone see your product for the very first time. Or seeing the expression on someones face when they are really into a certain necklace. Or being able to listen in on comments made between friends about your work when they think you aren’t listening. Hearing a girl try her best to convince her boyfriend to buy her a pair of earrings. Or that moment when your painting caught someones eye from across a stream of people flowing down the street, then watching it pull them all the way into the booth. Moments you will never get to experience when selling online. i also love the display aspect …. so much fun! Let me reiterate I absolutely love my online shoppers and supporters. You guys are who got it going and keep the momentum up. Thank you all so so much! Also, the talking to people. That alone is a huge step for me. When I began this all I was able to talk myself into selling online because I can do it all by myself, sitting at home alone and not having to ‘sell’ myself or my work. I am not a sales person I tried that once and hated every moment of it (for more on that, check out my about page). So needless to say diving into the street fair world was a huge step for me. But the people made it so much easier than I had anticipated. Support and encouragement from friends and family is one thing, but hearing someone you have never met before in your entire life tell you that you are talented…. that is a fantastic feeling. Or the word – beautiful. Maybe I am truly just a girly girl in need of that superficial confirmation, but to hear a stranger tell you that your work is beautiful with such conviction in their voice and sincerity in their eyes… it feels pretty darn good. Honestly, after a day full of that I could care less whether or not I sold anything. Bottom line: I think street fairs ROCK! And there will be plenty more in my future! Hubster caught giving up a weekend day just for me… I am a lucky gal. I wish I was ballsy enough to book myself solid through the summer and do one every weekend, but alas, I like to sleep in too much and the Hubster might kill me for taking away all of his summer weekends. I really do appreciate and love him for all of his help, support and constant encouragement, so I suppose I have to let him have a few weekends off now and then. Last one for this summer will be Belmont, September 8th! Come and feel the love with me! 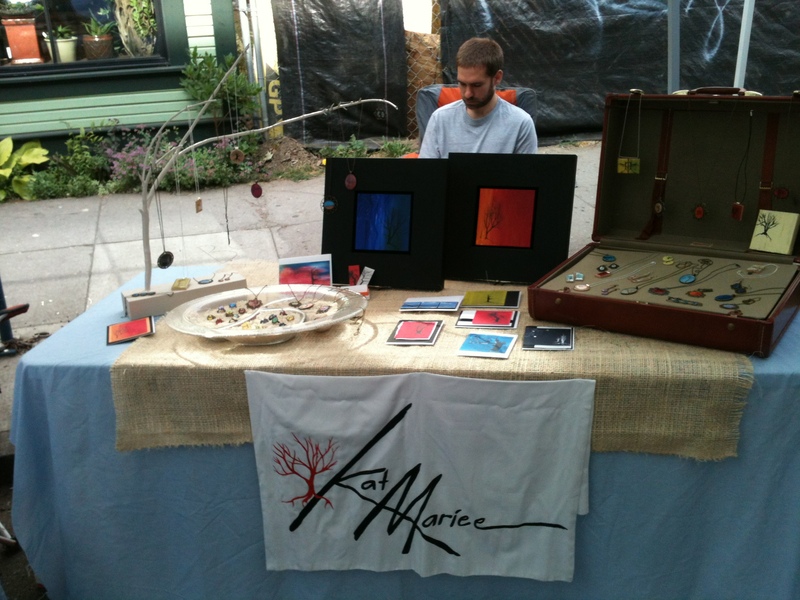 Side note: at both of the street fairs this summer a strange kismet was at work and I was placed right next to the same booth of really nice and inventive guys. If you live in the Portland area and have a composting bin that you can’t figure out what to do with… you should probably get yourself a Kitchen Compost Caddy… really they are nice people. You know how you can hear a song and it takes you right back to a certain place, or time, or reminds you each and every time of so-and-so, or brings you plummeting, head first, right back into that one specific point in time with all the visual, tactile, and emotional trimmings? I woke up with this playing in my head this morning. **Note I realize I am posting this on a Friday and as I mentioned in my last post Fridays are reserved for 80’s…. sorry, I started writing this on Wednesday… I am a little slow at this blogging thing. But to make up for it, and because it is necessary for all Fridays, here is your 80’s fix: Happy Friday! Aren’t they pretty? Ohhh, and there’s something in this pic hinting at what they are going to be! 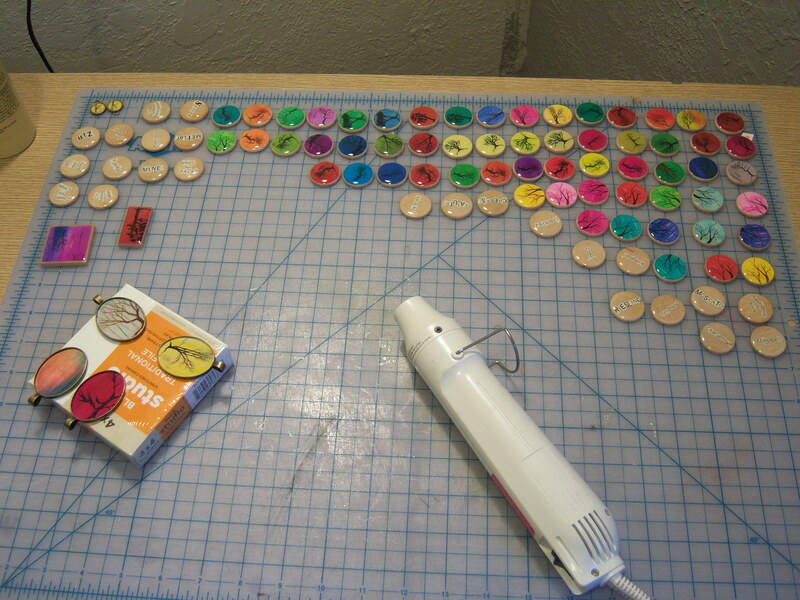 Any-who the main point of this random posting today is to tout the amazing wonders of my new heat gun. The heat gun I got was intended for embossing and super fancy-pants scrapbooking that I will never have enough ambition or patience to even attempt, much less complete. No, no, MY heat gun has other things in its future! But let’s back up for a moment. Last fall I attended the always wonderful Crafty Wonderland Holiday show. It was fantastic. I gathered cards from other fantastic local makers, artists and crafters. I bought a few Christmas gifts. The hubster even (very sneakily) bought my Christmas gift right under my nose! 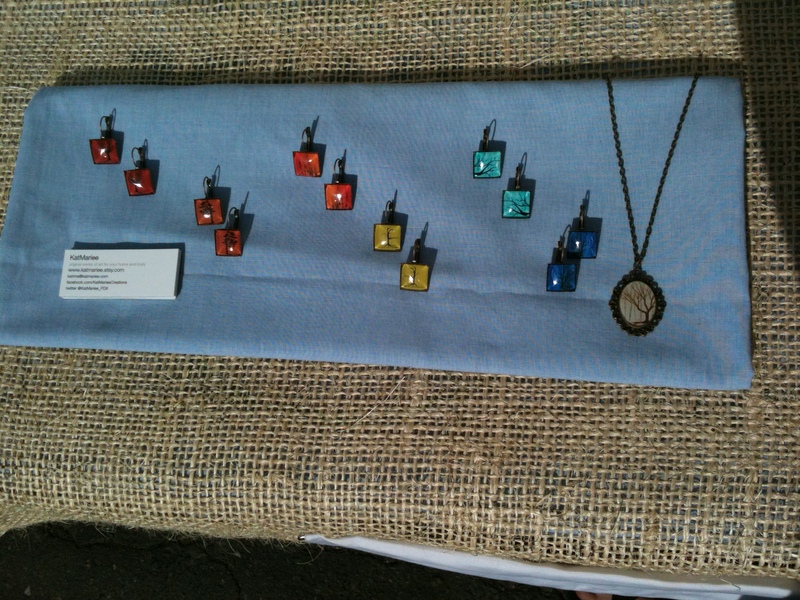 As I was wandering about in a fog of awe and inspiration, I came across these lovely pendant necklaces that looked very similar to my own. Wait, let me be specific here: if one of my necklaces were next to one of these necklaces, they would NOT have been mixed up. They looked totally different. 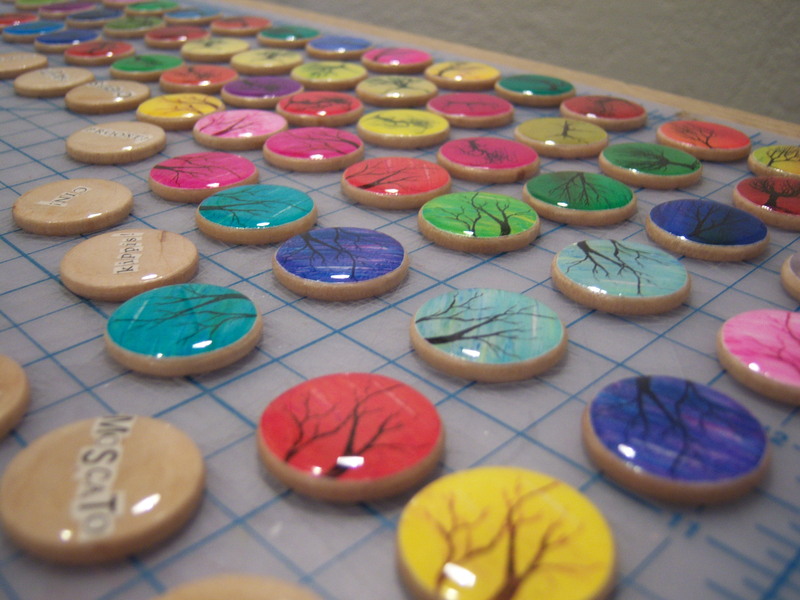 But they were making jewelry with prints of their own art work set in pendants under resin. Same technique, obviously different out come. Anyways, what really caught my eye was just how pristine their resin was! I mean glass-clear, perfect. I was in awe. I had to inquire just how they did it. I mean, it was perfect! Even what I was considering at the time as some of my best pieces still had tiny little bubbles in them. I was completely impressed. So I asked if they were willing to share their process or at least offer me some tips and what did I get in return? Hello, Helpful!! She not only gave me an extremely detailed step-by-step of what they do (temperature controlled room for 3 days, heat lamps, precise measuring, heat gun, the works) but she also told me that they offer a class once a month specifically focused on resin and getting it just right! At that point I finally looked up from the perfect jewelry that had me mesmerized and realized who’s booth I was in. It was Collage. A lovely little craft supply store on Alberta. (Looks like they recently opened a second shop down in Sellwood, too.) I have been there before, I knew they taught classes on these kinds of things, and I sorta felt totally oblivious that I hadn’t realized who I was talking to sooner… oh well. The heat gun. My newest love. It works like magic. Once you have your resin on whatever it is you are putting resin on, you just flip on your heat gun and lightly blow across the surface and like a swift wave of Hermione’s wand, they are gone. The big ones and the ones on the top go first, and if you are in the right light you can see the surface crackle across as they pop. It’s kinda cool. If your resin is thicker in depth you may need to go in with a toothpick and stir the ones clinging to the bottom free, give it another pass with the gun and they’re gone too! Just that quick. Done and Done! The first few times I worked with resin it took me at least an hour to lay the resin on the pendants then go back through with a toothpick turning each piece in the light just right so I could see all the bubbles and then fishing each one out… while the resin was slowly setting up… getting thicker and thicker on me… getting worse and worse the longer I fought with them. Basically: it sucked. I was frustrated. And riding the border to just going over to the dark side and trying this “diamond glaze” stuff…. Luckily I didn’t. Instead I happened upon the lovely wealth of information at Collage and am happily cranking stuff out left and right, I mean two batches in one night!? I felt like I was cheating it was so easy. Last night I was able to do TWO batches of resin, get them bubble free and still have time to make dinner, a new jewelry stand and some serious progress on my booth display! Hooray Heat Gun! And a bigger Hooray for Collage. I haven’t taken any classes there yet, but am considering the metal embossing one coming up (I will keep you posted if I do). Seriously guys, thank you! I suggest anyone in need of craft supplies, crafting tips of any kind, or if you are just looking for a fun new place to check out in Portland give them a visit! What is that I put resin on last night? you ask. They aren’t quite done yet, and I am still working on how to display/package them, but as soon as they are ready for your viewing (and purchasing) pleasure I will let you know, promise! I’m kinda excited about them. Also, if anyone has any questions specifically about how I work with resin, what I use, where I get it, or my jewelry making process, just ask me. I am happy to share. I know a lot of people in the craft world have very unique, personalized ways of working that they view as their own and guard very closely, and I understand that for some things. However, if it weren’t for YouTube and Etsy discussion boards I wouldn’t have had a clue as to where to start. So, if you have any questions, just ask, I am glad to share any info I have and, of course, welcome any additional tips you may have! New Blog Beginning in May!… now! Well…. not really. Its been here for a bit but I was using it just for the design side of things. I have decided that I want it to be all of KatMariee and not just one aspect. It’s time I put all of me into something rather than simply pieces and parts. So here we go. My blog. The Graphic Design site is still here too, no worries there. Actually there may be another post on a new client here soon! Yay. Keep those referrals coming people, I love it! But now you will also get some of my art and jewelry and random goings on and happenings around Portland and awesome places to shop and… well… whatever else I decide to share.